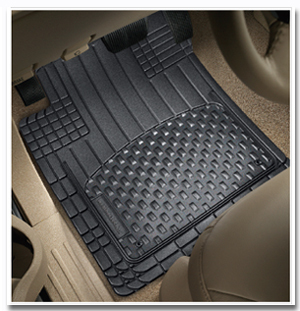 WeatherTech All-Vehicle Mats are premium cut-to-fit floor mats that trap fluid and debris away from your feet! Just like all WeatherTech floor mats, All-Vehicle Mats protect the factory carpet with deep, fluid-trapping channels. Cut them to fit any vehicle! Get a custom-looking fit without paying custom prices. The WeatherTech All-Vehicle Mats can be cut to fit your vehicle. Simply trim off any excess to get the right size mats. WeatherTech’s unique design looks so sharp; no one would ever guess that these are All-Vehicle Mats! 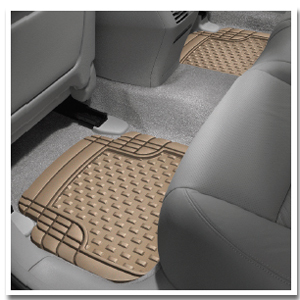 WeatherTech All-Vehicle Mats offer excellent protection for your vehicle’s carpet. Tall outer ridges and channels keep fluid and debris within the deep reservoir. Mud, snow, ice, and dirt stay on the mat and off the carpet. Get mats for the front and rear of your vehicle to keep the carpet in like-new condition. Each mat has retention nibs and WeatherTech’s patented MatGrip retention device to keep it from slipping and sliding underfoot. WeatherTech All-Vehicle Mats are made of an advanced rubber compound that stays flexible in the coldest temperatures. This rubber is completely recyclable, environmentally friendly and contains no harmful PVCs. WeatherTech All-Vehicle Mats are available in 3 colors to suit any interior – black, tan, or gray. Select front mats, rear mats, or a complete set of four mats. WeatherTech All-Vehicle Mats are proudly made in the U.S.A.
Keep your WeatherTech FloorMats clean and looking new by treating with WeatherTech TechCare FloorLiner and FloorMat Cleaner and Protector! Floor mats ship directly from the manufacturer by ground service. Expedited and international delivery are not available. *Because this item is drop shipped directly from the manufacturer, a $12.99 shipping fee will apply. Floor mats fit well and are very durable....will last for years. Love them!